Mayor Gene Autry, with the help of Marshal Breezie Larrabee, ousts crooked gambler Tod Rawlings and his gambling hall hostess from Quartz Creek, circa 1850. Gene then beats back an attempt by Rawlings to kidnap an incoming caravan of brides, whose presence in the community will certainly result in law and order. 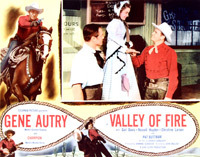 One of the arrivals, Laurie, is attracted to Steve Guilford, a conman working for Rawlings, but turns against him when she learns of his association with the frontier killer. Rawlings and his crew try once more to take over the town but Gene and the townsmen smash the bandits after a gun battle. Film Editor James Sweeney, A.C.E.